Some bulbs are a fleeting seasonal delight but you can’t say that about Moraea polystachya which has been a sight to behold for many weeks in our rockery and which will continue to flower for some time to come. The wiry stems are about 50cm high and while individual flowers don’t last long, fresh buds keep opening because it flowers down the stem, a bit like a bearded iris. The colour is an intense blue lilac with yellow markings. When the foliage follows, it is narrow and unobtrusive so these are not plants which take up much room. Moraeas grow from corms, like gladiolus, and most of the family hail, yet again, from South Africa. 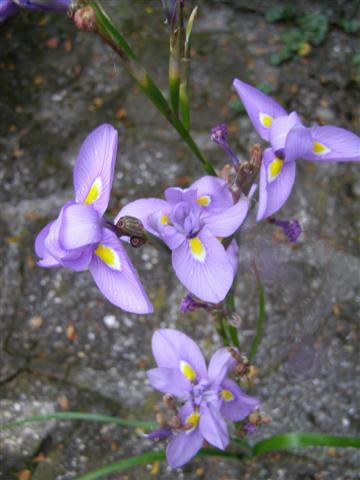 It is the spring flowering M.villosa which has given the common name of peacock iris to the whole family (its flattish blooms have markings like the eye of a peacock feather). Polystachya looks more akin to a dainty iris. It is not tricky to grow and seeds down easily in well drained conditions without becoming weedy. If you can find somebody with one, it sets seed freely and is easy to raise. I have never timed its flowering season from go to whoa but it is more likely into the months rather than days or weeks. This entry was posted in Plant collector and tagged Abbie Jury, autumn bulbs, Moraea polystachya, peacock iris on 14 May 2010 by Abbie Jury.